Germany’s second-biggest lender, Commerzbank, is planning to cut 9,600 jobs over the next four years and end dividend payments for the first time. In a statement, the bank said by the end of 2020 it would have “sustainably increased its profitability”. However, the bank also said it aimed to create 2,300 new posts in areas where its business was growing. Commerzbank’s strategy for achieving this will be debated by the bank’s board on Friday. Last year, it had about 51,300 employees. The announcement comes amid denials that the German government is working on a rescue plan for Deutsche Bank. 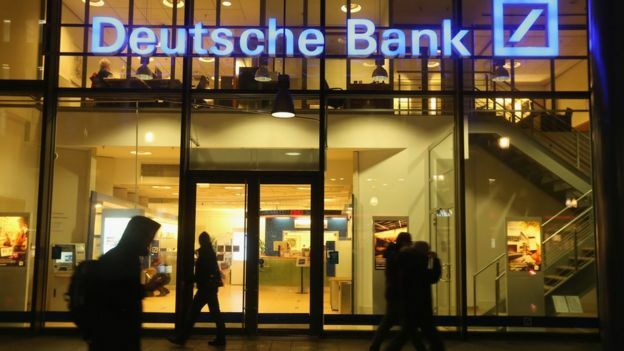 Deutsche Bank, Germany’s biggest bank, is facing a $14bn (£10.8bn; €12.5bn) fine in the US for mis-selling mortgage-backed bonds before the financial crisis of 2008. Commerzbank’s strategy will see it concentrating on its “core” businesses of “private and small business customers” and “corporate clients” and digitising some processes. As part of the €1.1bn (£948m) restructure, it plans to merge its “Mittelstandsbank”, which deals with medium-sized German firms, with its corporates and markets division. Commerzbank may therefore have to write off about €700m in the third quarter of this year. The bank said that would “reduce earnings volatility and regulatory risk and will free up capital to be invest in core client businesses”. Commerzbank is the second-largest bank in Germany. Yesterday the largest bank, Deutsche, had to deny it had asked the German government for a bailout. Now Commerzbank says its is planning a massive restructuring, involving almost 10,000 job losses and no dividends for shareholders. The restructuring is expected to save billions of euros a year and allow Commerzbank to invest in new sectors of business, creating new jobs in “growth areas”. Commerzbank is 15% owned by the German government, which took the stake to help the bank in the middle of the financial crisis in 2008. However, critics say that Germany’s banks have been far too slow to deal with the consequences of the credit crunch. Those banks face many similar problems: new competition, the higher cost of new regulations and all at the same time as ultra-low interest rates are hitting profits. 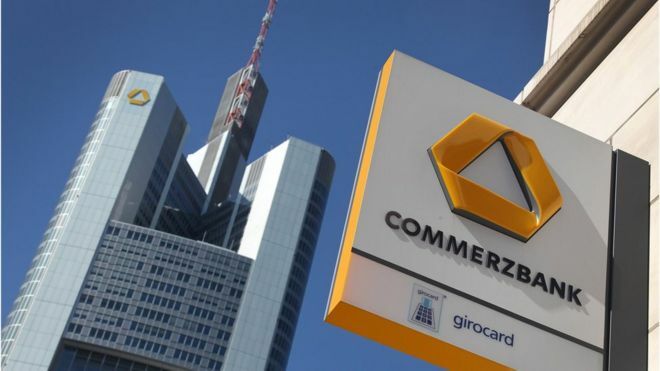 Despite the write-offs and higher loan loss provisions because of the weakness in the shipping markets, Commerzbank said it still expected to make a small net profit for 2016 as a whole. It said it would begin talks shortly with employee representatives about the job cuts, which are expected to amount to a loss of 7,300 full-time positions, once the creation of 2,300 new jobs is taken into account. Commerzbank’s shares fell by 3% in Franfkurt on Thursday. Meanwhile, shares in Deutsche Bank, which hit their lowest level in 30 years earlier this week, gained 1% on the German stock exchange, following a 2% rise on Wednesday. Despite the gains, however, more of the bank’s shares were being “shorted”.